Preserve your family history and share memories with friends and relatives. Perfect gifts for holidays, birthdays, anniversaries, celebrations and other special occasions! Your source for converting 3-D transparencies into digital photos! and scanned at 36-bit color in a dedicated slide scanner (not a flatbed scanner). Optional chemical cleaning is available to remove more debres. Digital cleaning software is applied by default to remove additional dust and minor scratches. Your stereo slides and their mounts are not disturbed in the scanning process. Options include scanning a Pair (both Left & Right) or Single(Left or Right window, your choice). Image files are put on hybrid (Mac & Win) CDs or DVDs and shipped with the returned slides. * Approximate size when printed at 100% -- See "Full frame" vs "Cropped". RGB (Red, Green, Blue). 300-dpi resolution, unless otherwise noted. JPEGs are in maximum (highest) quality format. Add $5% to each JPEG price listed above. A handy fill-in line is included on the order form to help you calculate the price for TIFF-RGB. TIFFs are not in LZW compressed format. Add 10% to each JPEG price listed above. A handy fill-in line is included on the order form to help you calculate the price for TIFF-CMYK. CMYK (Cyan, Magenta, Yellow, Black). 300-dpi resolution, unless otherwise noted. If you purchased scans of $100 or more (subtotal) during the past 30 days, SAVE 10% on your next scan order. To be eligible for the 10% savings, fill in your latest scan order receipt # on "Repeat Discount" line of the order form. Limited time offer. If you purchased scans of $500 or more (subtotal) during the past 30 days, SAVE 5%More on your next scan order. To be eligible for this additional 5% savings, fill in your latest scan order receipt # on "Volume Discount" line of the order form. Limited time offer. Set-up Fee . . .
A $20 set-up fee covers the safe air process used in cleaning loose surface lint from your slides and setting up the scanner software for your order. It includes burning the scans to disc (CD or DVD) and supplying the first set. Files will be put on a CD (700 MB maximum) or a DVD (4.7 GB maximum). These hybrid discs are compatible with Macintosh and Windows systems. If you are unable to read a DVD, please check "CD" in the Media section of the order form. If nothing is checked, the scans will be put on the disc that best fits your order size. As a back up, Wheeler Arts will store a copy of the scans for 30 days following shipment of the disc(s). Additional Copies / Duplicate Sets . . .
Add $7 for each copy of CD or DVD set. A. Which window(s) to scan: If single scan, you may choose left or right as you are looking at "VIEW FROM THIS SIDE" on the FRONT side. Mark the left or right window to be scanned by putting a small "X" below it on the FRONT side -- see example at right. B. Adjustments: Make sharper, lighter, darker, or Auto (automatic default setting in Digital ICE* software). Auto will be applied unless you tell us otherwise in your instructions. 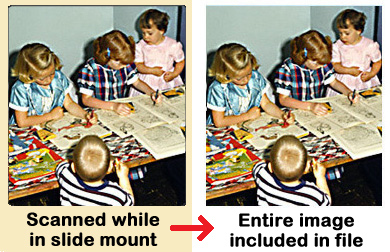 In some cases, the Auto setting will darken a faded image to capture underlying detail while scanning. Ph 217.359.6816, 9:00am-1:00pm (Illinois time) Monday-Friday. Closed weekends and USA holidays. We don't rotate images unless you tell us otherwise in your instructions. Digital ICE* software eliminates most dust and fingerprints plus minor scratches during scanning, without removing image detail. This automated dust-removal method does not remove imperfections, dust embedded in the slide or mold / mildew damage. Scanned images are not manually retouched. "Full frame" vs "Cropped": Approximately 1-2% of the slide scan (along each of the four edges where it meets the cardboard mount) will not be effected by Digital* software. 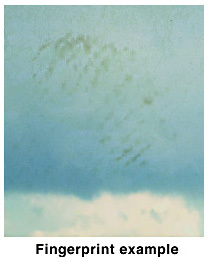 Thus, cropping (trimming the four edges of the scan) may be beneficial. However, cropping will reduce the printed size of the image by 1/4" or so. For the entire scan, including area along each edge where slide meets the cardboard mount, check "Full frame" on the order form. For a cleaner edge and slightly smaller image, check "Crop edges" on the order form. Since the left window is shot at a different angle than the right windows to create a 3-D "stereo" view, the two windows are slightly different. Be sure to look at the left and right window independently when selecting a single window. We are unable to scan slides in glass mounts. Please send only slides mounted in cardboard. Twisted and no longer lie flat. This can create a slightly distorted or out-of-focus image when scanned. Faded or lighter, often appearing to have a yellow or reddish look. In some cases, the Auto setting will darken the scan to capture underlying detail and improve the image. Auto may also increase the blue and/or increase contrast. Mold / mildew infected. Common on old slides, mold or mildew growth is the biggest problem film faces. Even for a short period, slides stored in humid or damp areas are susceptible to catching mold. It can eventually eat away film emulsion and there's no easy way to remove it from film without leaving a mark. 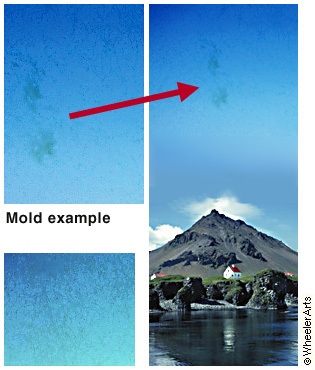 ICE only removes minor scratches and debris laying on film surface and won't remove this type of defect during scanning, but ICE can often lessen the mold's visibility. If mold damage is in skin or other tough-to-clean areas, the only option for repair is often a more costly restoration of the scanned image -- sometimes using digital manual touch-up. The higher the scan resolution, the more prominently the mold damage will show. So, the sooner you have the slides scanned the better -- once mold takes hold it can continue to grow until totally destroying a slide's image. Embedded with foreign particles such as tiny dirt or dust, especially on the delicate emulsion side. Chemical Cleaning Service (optional) . . .
On many slides that have mold/mildew, fingerprints or particles, it isoften possible to chemically clean (or improve) those areas by hand with "PRO-LINE CLEANER film & negative" liquid solution. If you would like for us to include this service, add $10 per window ($20 per pair) in the space provided on the order form to cover the extra time in cleaning and cost of the cleaner. Digital Restoration Service (optional) . . . In some images that have mold/mildew or embedded foreign particles, we can digitally restore those areas by hand in photo-retouching software. This process takes extra time, so let us know if you would like a quote for this service. We will be happy to give you a cost estimate once we review your slides for quality. Shipping & Handling . . .
S&H on Scans (CDs or DVDs): $7.95 per order for Ground; $17.95 per order for Air. S&H on Returning Slides: $5 per pound, rounding up to the nearest pound, Ground only. (Example: 2-pound 4-ounce box of slides would be same as 3 pounds and cost $15 for their S&H). Inquire for Air. Insurance: We know your slides are irreplaceable and we take the utmost care of them while in our possession. However, in case they get lost or damaged on their way home, you may insure them by including $2.00 for each $100.00 value of coverage. These S&H rates are for USA only. Please contact us for rates and availability to Canada. Standard turn-around: Non-rush slides are scanned and orders filled "First In, First Out." Due to current demand and volume, please allow 4-6 weeks for delivery of disc(s) from the time we receive your slides. Closed: Weekends and Holidays to give staff and equipment a rest. Rush Fee (optional) . . .
Add 25% of subtotal if you would like your disc(s) delivered within 4 weeks from the time we receive your slides. Add 50% of subtotal if you would like your disc(s) delivered within 3 weeks from the time we receive your slides. Add an extra day if USA Holiday falls within the time frame. Research & Development . . .
After months of research and development we created a system to scan stereo slides (Realist 3-D color transparencies) with a Minolta* dedicated slide/film scanner. Our special slide holders eliminate the need to cut apart or remount the transparencies. Our dedicated slide/film scanning method produces sharper stereo scans with truer color and more detail than do flatbed scanning methods. Left and/or right windows of the stereo slides are cleaned with compressed air and scanned using Digital ICE* or equivelant software. 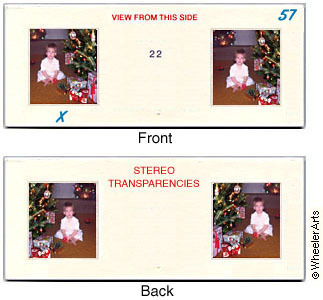 Your stereo transparencies and their mounts are not disturbed in the scanning process. If additional treatments are needed (rotating, sharpening, re-sizing, color adjusting, etc), Photoshop* is used. * Digital ICE trademark is property of Applied Science Fiction; Minolta trademark is property of Minolta Co, Ltd; Photoshop trademark is property of Adobe. Realist Format . . .
3-D slides (stereo transparencies) are in either 5-perf "Realist format" (pairs of 5 film sprockets per image) or a wider 7-perf "European format" (pairs of 7 film sprockets per image width). 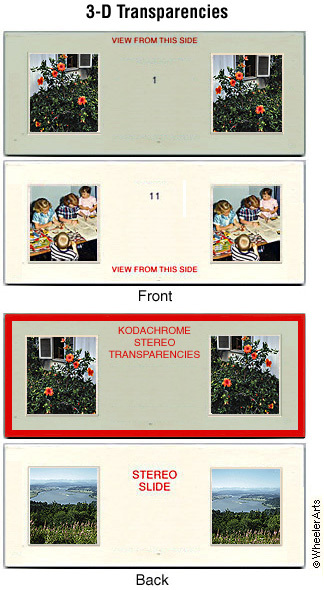 So far, we've seen the 3-D slides (such as Kodachrome Stereo Transparencies) only in the Realist format -- the most common stereo image format. Ph 217.359.6816, 8:00am-1:00pm (Central time) Monday-Friday. Closed weekends and USA holidays. WheelerArts.com ~ Stereo Slide Scanning Service. Your source for converting 3-D transparencies into digital photos. Without disturbing their mounts, stereo slides are scanned in a dedicated unit (not flat bed scanner) -- saving vintage images to CD or DVD. Preserve family history and share memories with friends and relatives!